I arrived at the conclusion that occupational therapy was a great career path for me through the “trial and error” method of majors during my undergraduate studies. Although at the time I felt left behind and frustrated as many of my friends were declaring majors in our first year and a half of college, looking back, all the classes I took and self-discovery I went through were worth it as eventually I came out with the right fit. I actually began my undergraduate career as an architecture major. For various reasons and interests, such as the creativity that architecture entailed, I really saw myself in this profession. However, soon all I could foresee were late nights in studio and desk-based work. I realized pretty quickly that I was looking for a field that would offer a more dynamic work environment and more human interaction! This led me to another side of the academic spectrum: education. Again, I took wonderful classes that fit many of my interests, but I still wasn’t confident that education was totally me. I found through tutoring students that my strengths are in one-on-one interactions rather than a large group setting. I also wanted to assist people in achieving what they wanted, rather than what was on my agenda. Around this time my mom had seen an article about occupational therapy and told me that this field really reminded her of me. I did my research and found that this career matched what I valued: creativity, continuous and changing challenges, up and moving work, interpersonally based career, and allowing your clients to decide what is important for them to achieve. I loved the idea that this profession is really anything you want it to be. With occupational therapy school as a goal in mind, I choose kinesiology as a major to fulfill many of the prerequisite courses. Kinesiology was a great choice as it set a foundation for understanding how individuals experience their body: biologically, physiologically, sociologically, and psychologically. Now moving into my second year of the entry-level Masters program at USC, I am more confident than ever that I want to be a professional that has the medical and science background, but strives to see the big picture for each individual I encounter: which is to ensure that clients are able to maintain participation in meaningful occupations. To any prospective students that are trying to figure out how to make themselves a great fit for occupational therapy school, my advice is to be you and continue to do everything that you value, as this is core to what we advocate! In retrospect, all of my above fields of study could still have led me to where I am now. In architecture, my knowledge of the built environment would contribute to an understanding of how individuals are able to participate in occupations. From the education field, the learning process is innate to the occupational therapy profession as well. Whatever you love to do and interests you is essential to your development and path to becoming a great occupational therapist! Looking Back: 2nd Year → Graduation! 2nd Year of OT school! There is so much that I could talk about within the last few weeks, let alone, my whole second year! I can’t believe that’s it’s already time to graduate! Have you ever felt that you had so many things to do and just not enough time to do it all?! I imagine many people can relate. That’s how I felt for the last month of this past semester. Not only was I trying to keep up with my weekly school work, I was preparing to take our comprehensive exam at the end of the year and thinking about my summer fieldwork, which I will be going to Hawaii (my home) for. Just a few weeks ago, I was wondering how I would ever get it all done, and now, I will be graduating! The comp exam, which covers all our second year material and is required to pass in order to graduate, is finally done—what a relief! Although I was really nervous for it, as I am with any exam, I felt assured that I had learned all the material once before, so I should do well. To find out that I passed was the last thing before graduation! 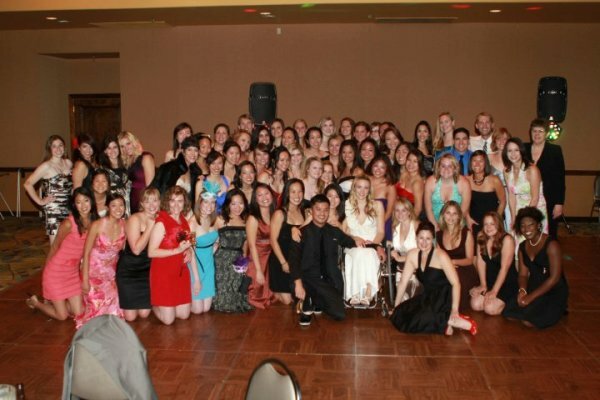 Tomorrow, we will be graduating as the USC OT Class of 2010!! We’re making history! Next for me is my last level II fieldwork, which will be on the outpatient service at a hospital in Hawaii where I’m from. I’m so excited to be moving home! It’s really weird because I’ve been in California for a while, but I think I’m about ready to move on to this next chapter in my life! Looking back on my second year, there are so many things that happened, it’s hard to capture it all in one blog. I will post a few pictures of some of my favorite memories! In November, last fall, I had the opportunity to attend the AOTA Student Conclave, which was held in Baltimore. I travelled with Grace, a fellow OT student and along with going to to conference, visited friends, toured D.C., and lobbied on Capital Hill Day at Senator Boxer’s office (see picture below). It was a lot of fun and a good break before the semester finished. I enjoyed spending time with my classmates outside of class and getting connected with the OT community. It was a great experience and I highly recommend it if you get the opportunity to go to something like that! Another fun break toward the end of the fall semester was going to my very first and only USC football game! It was so much fun to hang out with friends and have the “real” USC experience! I was able to go to the USC v. UCLA game, and we won!! It was a great end to the semester, even though the football team didn’t do as great as they usually have done in the past! I’m not sure I’ll ever be able to go to another USC football game, although USC does play UH (University of Hawaii) at Hawaii in their season opener next season! So, we’ll see! Throughout the whole second year, as you probably already know, I was a student ambassador for our department, along with Sarah, Michelle, Myka, and Gus. It was truly a great experience for me to work close with our recruitment office. We were all able to do grad fairs, information sessions, recruitment for our Occupational Science minor classes, tabling events at the main USC campus, and many more fun events to promote OT! Having the opportunity to do this has made me even more passionate about my profession! It gets me so excited to talk to others about what OTs do because of the great services that OTs can offer almost everyone! Besides work, it was a great time to get to know the other ambassadors and we have really become a lot closer through our experiences together! And finally, OT banquet! What a beautiful way to end the semester, year, and OT program—yummy food, great people, fun music and dancing!! Although not everyone in our class could attend, it was a fun night to get together and just relax after our comp exam! We only talked about the exam a little, but we were able to fully enjoy the night anyway, despite not knowing if we had passed yet! Maintaining wellness results from a good balance of work, rest, and play so I’m getting a good amount of play before my last fieldwork starts!!! These last couple of weeks have been intense with papers, exams, and comps. But I survived, and part of what has helped me is reading and playing music… I’ve been able to squeeze in some leisurely reading (Alice’s Adventures in Wonderland), play some gigs with my mariachi ensemble, and jam on my own. Speaking of playing gigs, the mariachi that I’m in, Mariachi Sur de California, recently played a few gig on 5 de Mayo one of which was really fun; Los Angeles Southwest College put on a 5 de Mayo event on their campus for local elementary school children. The band had never had a crowd that was so in to the music, just about everyone stood up; children clapped, people sang… it was the most gratified I’ve ever felt at a gig. Also, we played at a church for Mother’s Day; that too went very well. It feels good to be playing and engaging in one of my most favorite occupations. I also like to record on my free time, but lately I haven’t been able to and so I just jam on my own and I keep practicing snippets of ideas that I come up with so that I can record them over the summer when I have some time. I can’t wait to get to get this summer started; you could say that I’m about to embark on my dream fieldwork experience. I’m interested in going in to the field of mental health, preferably in community mental health settings, but I also am interested in phys-dys. So, long ago when I was picking out my top ten choices for this summer’s fieldwork I spoke with Jaynee, our Fieldwork Coordinator, about what I wanted and she really helped me out in finding locations to pick from; she brought up transitional living centers (TLC’s). I was excited about this for I had observed a TLC during one of my earlier rotations. A TLC basically helps individuals that have come out of inpatient acute rehab to reintegrate themselves back in to their communities. It involves facilitating how to get around, going grocery shopping, and helping them organize their day so that they may be independent among other things. To me it’s the perfect balance between the two worlds I want to combine, though mental health is and can be applied in any setting at any moment, I think the TLC will be a great fit for me! OH! also, about a week ago I went to AOTA’s national conference in Orlando! It was a great experience. There was a workshop that caught my attention which I’m glad it did; “Engaging Marginalized Populations Through Qualitative Research”. This was one of the the most up was one of the most interesting workshops I attended. It touched about understanding the experience of marginalized populations, and how these experiences influence their occupational choices and participation. There were three speakers each touching upon the experiences of the the undocumented in the US, people suffering from obesity, and women who have just come out of incarceration. Learning of how stigmas influences these populations occupational choices and participation was very eye opening to me and has further encouraged my desire to do research in the future. The Q&A afterward was very engaging as well. I think the main take home message was that as OT’s we need to advocate for populations that are suffering from occupational injustices**. That in addition to advocating for our profession we must also prioritize advocating for populations in need of occupational therapy and break the borders that currently create this schism between OT and underserved populations! It was a very exciting, uplifting, and refreshing workshop to say the least… and it was very unfortunate to see that so few people attended! This conference was significant not only because it was my first, but also because Dr. Florence Clarck was inaugurated as AOTA’s president! Congratulations Dr. Clark! Anyway, I’m “walking” this Friday and I’m very excited, but also a little stressed since my cap & gown have yet to arrive!!! But I’m sure all will be fine, as everything always does!! **Occupational justice= the concept that, to develop and thrive, humans are beings that need and want to participate in occupations. So, when there’s an occupational injustice due to a disability or environment, the focus is to enable these populations/individuals to access opportunities and resouces so that they may develop and thrive. Only 3 more days to go!!! Happy belated Stress Management Day! To celebrate, we had a couple activities (aroma therapy, crafts, Japanese tea ceremony, breathing workshops and my favorite activity…snacking…on healthy snacks of course) on the main campus yesterday to help students de-stress before finals. If you’re on main campus next semester, make sure to check us out the week before finals! Good luck on finals everyone, and HAPPY OT MONTH!